On a recent moonlit Saturday night, folks glancing from John Brewers Bay beach toward the barely visible horizon might have seen a dozen or more eerie points of light, moving and flickering half way between the shoreline and the Cyril E. King Airport runway. There was nothing spooky about the confounding luminescence, only a few dozen teens, parents and science geeks wading through the shallows on the eastern end of the bay on a Seashore Trek. The evening’s event marked the close of the third annual four-week Youth Ocean Explorers Program, hosted by the Virgin Islands Marine Advisory Service, according to a news release issued by the program. The evening’s event was the first of many planned ongoing opportunities for YOE participants to continue their discoveries in marine science. 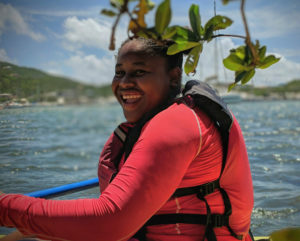 Charlotte Amalie High School student Kadejsha Tonge, 14, said the YOE program, “opened my eyes to how sick” the ocean had become and made her want to “fix” it, the news release said. She said the hands-on experience she gained this summer and during her previous two summers in the program will help her in that endeavor. Youth Ocean Explorers, the ambitious offshoot of the five-day Coral Reef Discovery Week of several years ago, is open to students in grades seven through 12. Trevett Williams, 15, is also in his third year with YOE. “I have always loved nature,” he said, adding that he intends to eventually make a career in ocean science. In fact, according to program director Howard Forbes Jr., 10 of the 23 young people who completed the summer program intend to pursue marine science as a course of study. This is good news for the sponsors and the University of the Virgin Islands. The program provides a broad overview of a variety of marine career opportunities including oceanography, watershed resource management, marine biology, larval ecology, fisheries science, robotics science, and DNA engineering. It’s prime goal is to encourage more local young people to gain interest in and pursue STEM careers – that is, careers in science, technology, engineering and math. In fact, YOE is part of a marine science career pathway program at UVI which is funded by the National Science Foundation’s INCLUDES program. (INCLUDES stands for Inclusion across the Nation of Communities of Learners of Underrepresented Discoverers in Engineering and Science.) Next year, the program is scheduled to continue with additional funding from the U.S. Environmental Protection Agency and matching funds from the Community Foundation of the Virgin Islands. This career pathway program is called SEAS Your Tomorrow (SEAS stands for Supporting Emerging Aquatic Scientists.) The SEAS Program provides hands-on research opportunities for freshman and sophomore undergraduate students at UVI through summer internships with community, science-oriented partners like the Department of Planning and Natural Resources and The Nature Conservancy. The SEAS Your Tomorrow Program also provides new opportunities for masters students at UVI through the Bridge to the Ph.D. Program with Pennsylvania State University. This eight-week summer experience gives UVI masters students the taste of what a doctorate program is like and provides new career training skills in the marine sciences. 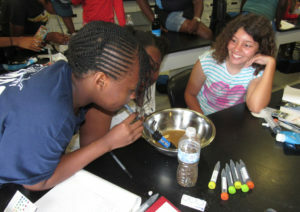 “A program like this is important, particularly for getting more students from underrepresented and underserved groups in STEM involved in the ocean sciences, which is one of the least diverse of all the STEM fields,” said Kristin Wilson Grimes, assistant professor and project lead for the program. 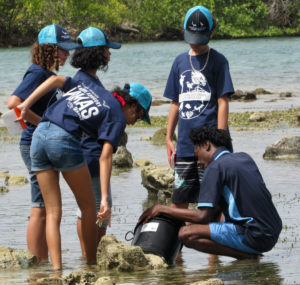 The enthusiasm of young people like Williams is the spark organizers hope to ignite in local youngsters through classroom laboratory sessions and hands-on activities that bring them up close and personal with marine plants, fish, coral and invertebrates in the first two weeks of the program, according to the news release. The second two-week piece of the program introduces ecological principals such as marine-animal interactions, marine-debris issues, global warming, water-quality testing and the impact of human activity on environmental health. 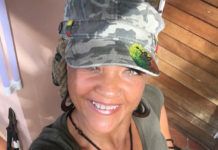 Tonge demonstrated her accumulating knowledge as she expressed her concern over humanity’s lack of stewardship of the natural world under the sea. “Over my last three years I have seen the corals become more unhealthy,” she said, “and it’s us” doing the damage. 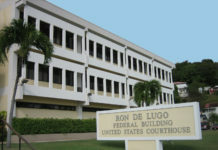 One of the observations made by both Tonge and Williams was the abundance of algae that had accumulated in the bay, especially by the dock at the University of the Virgin Islands Center for Marine and Environmental Studies. They attributed the aggregation to the activities surrounding Hurricanes Irma and Maria in September 2017, saying the algae was not visible the prior two years. The two expressed concern that the algae prevented the small fish predators from reaching through the thick masses of growth to feast on the smaller fry, or “bait fish,” as they are known. The proliferation of the smaller species used by local fisherman led to boats not usually found in the sensitive area navigating the shallow seabed to capture the small fish. The shallows are home to many other species with a potential for serious, even fatal, damage to the developing sea creatures who make their homes in the warm, safe waters. Forbes said he was happy to know the students were concerned. 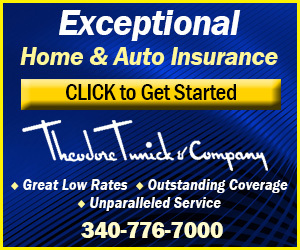 “That’s what we are hoping for,” he said. Tonge and Williams, along with the other 21 students who completed the four-week course, initiated independently driven projects with little external input or influence. The students chose their “capstone projects” while mentors provided some insights and suggested methodologies along with a little guidance and materials as needed. The student groups were inspired by some of the information given to them early on in the program and decided which topics they wanted to explore further on their own. 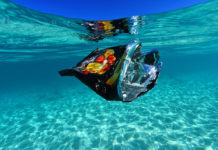 – A marine debris art project which dramatically showcased the negative impacts of single use plastics through the creation of a plastic jellyfish built from only such debris. Tonge was quick to point out that sea turtles often mistake plastic bags for jellyfish, their food. When the turtles ingest the bags they eventually die. As part of the efforts to engage YOE students beyond the summer, eight students have begun open water scuba certification classes courtesy of Coki Beach Dive Shop. Along with classroom instruction, participants’ swimming abilities are evaluated and, if necessary, swimming lessons are provided by lifeguard certified team leaders. The YOE news release said. Additionally, because Youth Ocean Explorers mirrors the university’s masters of marine and environmental studies program, students are also provided with professional development opportunities, such as how to communicate scientific concepts in laymen’s terms and public speaking in general. 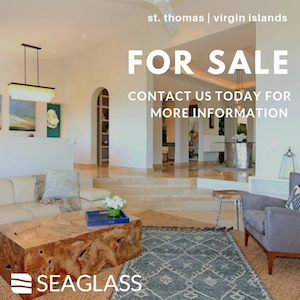 The program is funded and supported by the Community Foundation of the Virgin Islands, Tropical Shipping, the Prior Foundation, Lana Vento Charitable Trust, the Marine Rebuild Fund and VI-EPSCoR. Not only did the sponsors’ financial support allow the organizers to waive the $300 per person registration fees this year, it also provided students with an opportunity to become scuba certified. Each student will also receive his or her own professional- grade snorkel gear. Facilitators of the program hope to extend it to St. Croix and St. John, or to implement a residential option to allow students from across the territory to come to St. Thomas.